Miller’s ineffectual outing would have been a stunner two years ago, when manager Terry Francona leaned on him for as many as eight outs at a time while Cleveland played all the way to Game 7 of the World Series. It was game-changing when Francona called on Miller as early as the fifth inning that fall, but such aggressive bullpen management has become common around the majors since. Miller hasn’t been the same this year, a season that included three stints on the disabled list. Cleveland was clinging to a 1-0 lead with two on and one out in the sixth when Francona called on Miller. Gonzalez immediately drove a two-run double to deep right field. Miller then walked Carlos Correa, let both runners advance on a wild pitch and intentionally walked Tyler White before Francona came for the ball. Miller had only allowed one previous inherited runner to score in his postseason career, when David Ortiz brought in Dustin Pedroia with a sacrifice fly for Boston during Game 3 of the 2016 AL Division Series. Cleveland won that game 4-3. The lanky lefty had a 4.24 ERA this season, his highest since a 5.54 mark mostly as a starting pitcher for Boston in 2011. He was sharper down the stretch until getting hit around by the last-place Kansas City in his last regular-season appearance. Francona’s other option in that spot was right-hander Trevor Bauer, an AL Cy Young Award contender as a starter before a line drive broke a bone in his right leg in August. Francona said he didn’t consider bringing in Bauer instead of Miller for Carrasco. Bauer looked sharp in three abbreviated outings at the end of the regular season, and Francona had said Bauer could be a Miller-like long-relief option this October. That hasn’t worked out, either. Bauer entered in the seventh inning of the opening 7-2 loss and allowed an RBI single to Bregman, as well as a double to Yuli Gurriel. Bauer then relieved Miller on Saturday and pitched out of a bases-loaded jam before allowing a solo homer to Bregman in the next inning. Francona is running out of reliable options. Longtime closer Cody Allen allowed Martin Maldonado’s homer in Game 1, and Dan Otero gave up a run in the eighth inning of that game. On Saturday, closer Brad Hand allowed two baserunners before pitching out of the eighth. Only sidearmer Adam Cimber has managed to avoid trouble through two games. The bullpen was an issue all season, ranking 25th in the majors with a 4.60 ERA. 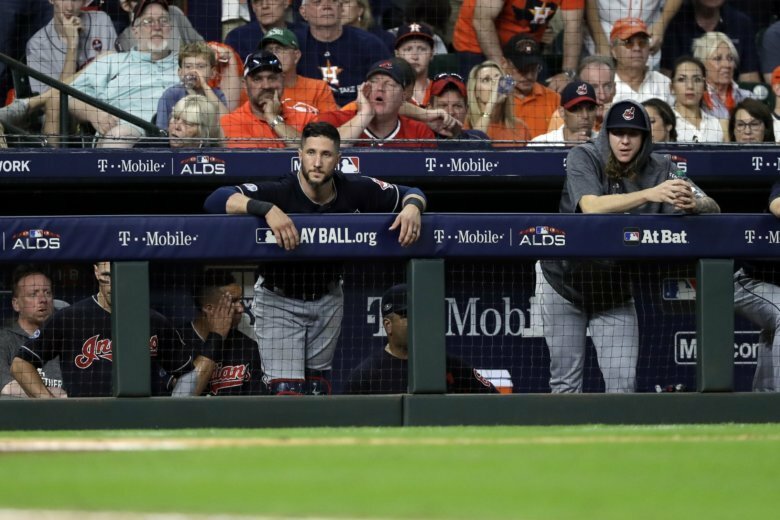 Cleveland still cruised to its third straight AL Central title largely by leaning on its overpowering starting rotation; its relievers accounted for the fewest innings in the majors. Yet Francona was quick to yank Carrasco, after 77 pitches. Facing elimination in Game 3 on Monday, the Indians will be hoping for more from Mike Clevinger. Otherwise, this October may be a short one for the 2016 AL champs.